The Belgian Joseph Merlin is credited with inventing the first roller skates in 1760; wearing his new skates at a party in London, he crashed into an expensive mirror. The early skates had iron wheels. 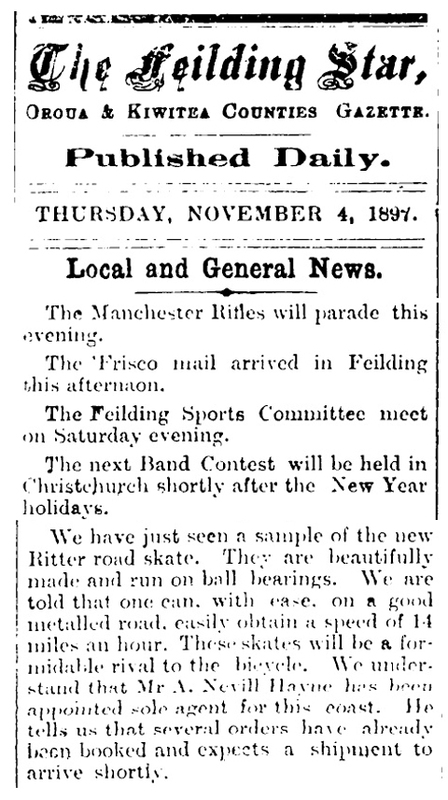 Road skates such as the Ritter became popular in the 1890s. 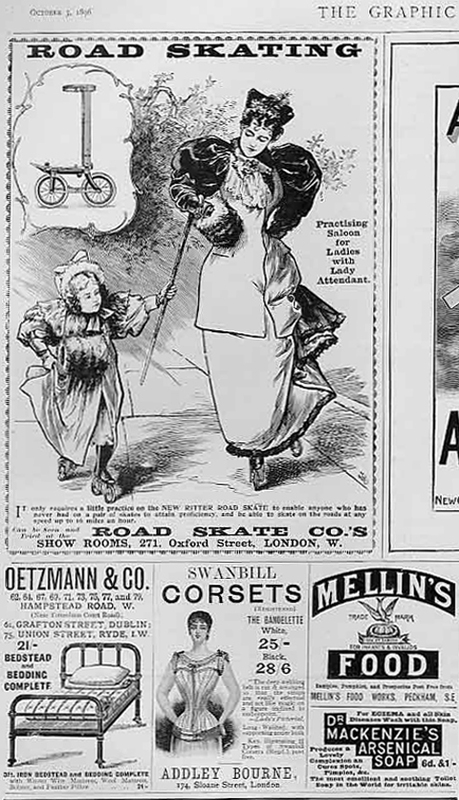 While ice skating and quad roller skating were favoured by women, road skating became a predominantly male sport. Every Ritter skate is stamped either ‘left’ or ‘right.’ It also shows the size. One of this pair is a size 10 and the other a size 11. However, they are the same wheelbase and size. Every skate is hand built so they do vary, and sizes appear to relate to width as much as length. Each Ritter skate has a brake with a return spring and an eyelet at the top. String is attached to the eyelet and the other end could be held in the skater’s hand. My assumption is that this would have been for novice skaters. However, this gives the impression that the skater would bend down and pull the string to activate the brake, which is wrong. In fact the string extended to the skater’s pocket, and sometimes had a wooden handle on the end. These skates need a length of string attached if you wish to activate the brake. If you look closely at the photos, you can see that each brake is fitted with a return spring. 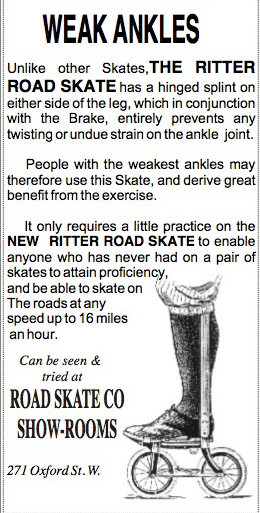 Ritter skates are well constructed. This pair is in good condition. Various minor repairs have been made, to a high standard, and the skates have recently been serviced. A bar on the side opens up to clamp the shoe in place, though the skates are made for people with narrow feet. 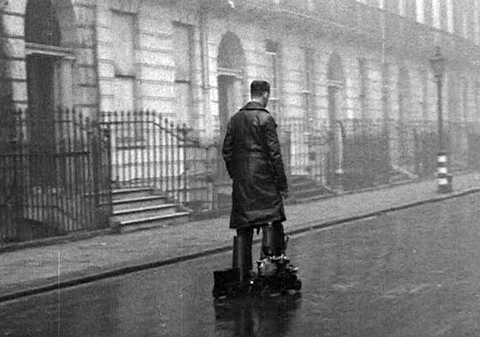 The boots supplied fit into the clamps, but modern shoes and boots with wider soles would not. However, if you strap the wooden supports around your leg, it’s not necessary to clamp the boots for casual skating. The wooden leg supports are in good condition, though one has had a past repair at the top (it has been glued). The boots are a narrow size and are in good condition. The gaiters are separate to the boots. The Ritter skates are sturdy and fully functional. Each skate carries Ritter’s patent stamp and the company name and address. 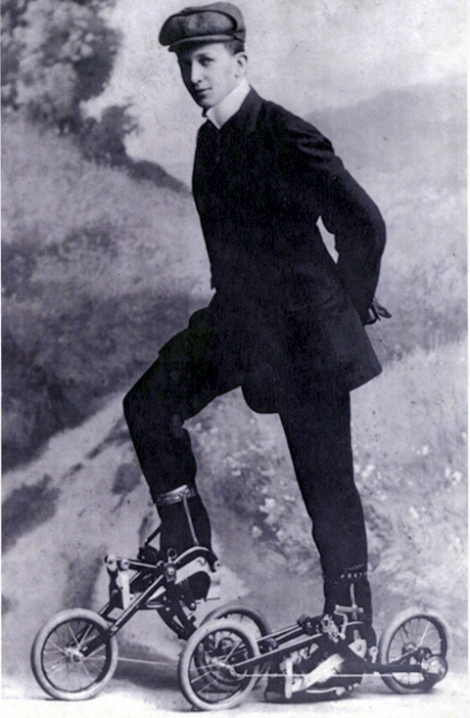 The rather more advanced pair of skates shown below are from 1905.